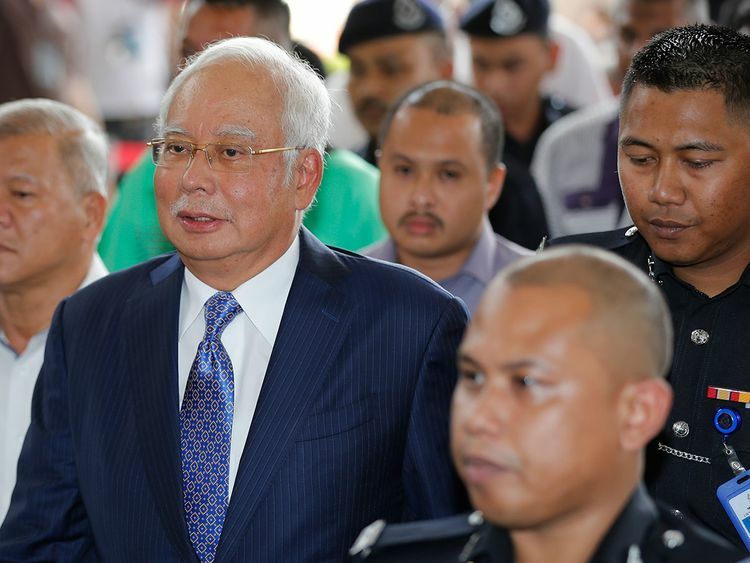 Kuala Lumpur: Former Malaysian Prime Minister Najib Razak appeared in court Wednesday for the start of his corruption trial, exactly 10 years after he was first elected to office only to suffer a spectacular defeat last year on allegations he pilfered millions of dollars from a state investment fund. He pleaded not guilty to all charges as the trial begun. The trial was originally due to start in February but was delayed by procedural matters. Najib's lawyers filed an urgent motion to challenge the charges, which include criminal breach of trust, money laundering and abuse of power. The High Court judge said he will hear the application at a later date and ordered the trial to proceed. Ten years ago this Wednesday, Najib became Malaysia's sixth prime minister but anger over the 1MDB investment fund scandal led to his electoral loss last May. US investigators say more than $4.5 billion (Dh16 billion) was stolen from 1MDB by associates of Najib between 2009 and 2014. They say the ill-gotten gains were laundered through layers of bank accounts in the US and other countries to finance Hollywood films and buy hotels, a luxury yacht, art works, jewelry and other extravagances.